Welcome to the website of the Liverpool Quiz League, part of the Merseyside Quiz Leagues, the world's longest running independent quiz league organisation. The Merseyside Quiz Leagues, founded in 1959, are the largest independent quiz leagues in the world. In the 2018/19 season there will be 31 teams in the LQL and over 100 teams competing in the MQL. Teams take part in their own local leagues, so that travelling distances are kept to a minimum. There are, however, opportunities to enter Merseyside-wide competitions at either team or league representative levels - our equivalents of UEFA club competitions and International matches! We are sad to have to let you know of the death of Dave Milward of Tramway quiz team. A long serving member of the League, Dave died on Sunday 31 March in Broadgreen Hospital. Our condolences to his family and to his friends. Details of the funeral arrangements will be posted as soon as possible. As announced previously it was hoped that there would be opportunity to raise a glass in Matt's memory. His daughter Isobel has been in touch to say there is to be a gathering in the Three Piggies (Old Bangers' home venue) on Friday 8 March at 2pm. 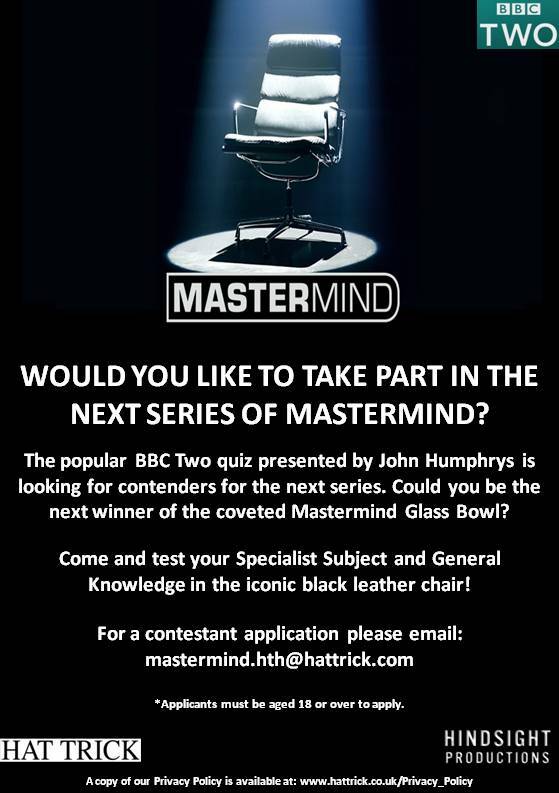 Matt's team-mates are sure that she would be very pleased to see as many of his quiz friends there as possible. The final of this year's Liverpool MIMIR heats took place on Wednesday 6th February 2019 at Aigburth People's Hall. 16 players took part, with the top two players from each four person match progressing through the competition. The players in the final were Mark Kerr (Victorian Cricketers), Brian Thompson (Aigburth People), Stuart Scholes (Kluggers) and Danny Grimes (Aigburth Swans). At the end of the regulation five rounds, the scores were Mark 12, Brian 12, Stuart 10 and Danny 11. This meant that the competition would have to be decided on a tie break, in which the tied competitors were asked the same three questions in turn, with the highest scorer winning. At the end of the round, both Mark and Brian scored two points, meaning that a second tie break round had to be played. In this round, Brian scored two out of three correct, but Mark answered all three questions correctly to take the title and the Arthur Evans Shield for the sixth time. The finalists and the top three scorers from the losing semi finalists will be invited to take part in the MQL MIMIR Championship, which will take place on Wednesday 20th March 2019, with the final being contested at the MQL Presentation night on 15th May 2019 at a Wirral Venue. Many thanks to all who came along and took part in this year's Charity Quiz at Christ the King Club. Congratulations to the Aigburth Swans/Oxton Cons team who won the trophy. 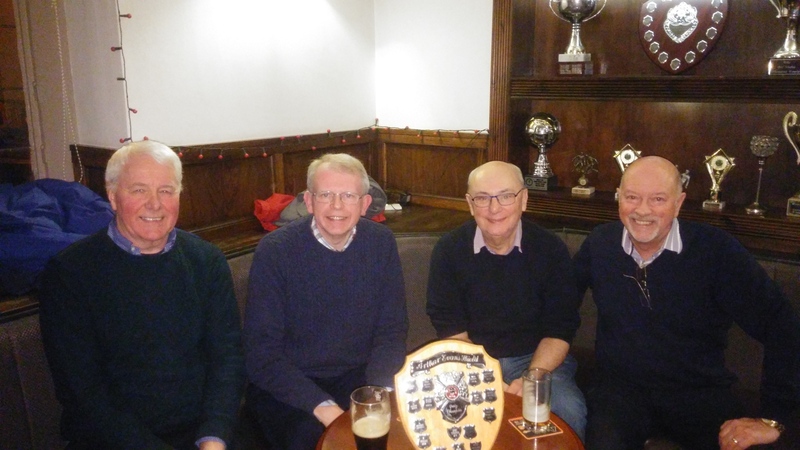 Particular thanks as ever to Brian Thompson for setting a challenging and enjoyable quiz, and to Keith Clare, Dave Cotson and Jim Martin who ensured the evening went smoothly. It was a thoroughly pleasant evening, and more than £400 was raised for Diabetes UK. We have been informed that at Matt’s own request there is to be no formal funeral service. It is hoped that there will be an opportunity to get together in his memory at some point in the near future. We are sad to have to report the sudden death of Matt Shore of the Old Bangers. Matt died at home on Tuesday 8th January, having played the previous evening in an away victory over the Bishop Eton team. Matt was a long term and much respected player, having played for many years in his team's previous incarnations as Baltic Fleet and Eleanors. Details of the funeral arrangements will be posted as soon as we have them.